The dream of the nineties will be alive in Nashville on July 21 when alt-pop band Veruca Salt play Mercy Lounge in support of their first new record with their original lineup since 1997’s Eight Arms to Hold You. The group split up after frontwomen and founders Nina Gordon and Louise Post got into an argument and Gordon angrily left the band. Twenty years later they’ve made up, gotten their original lineup together, and made a new record with their first producer that sounds like a natural follow-up to Eight Arms, just delayed a bit. A perfect show for those in the mood for a bit of nineties nostalgia. Pop punk band Charly Bliss and western dream pop act American Dream will open. Read on to learn more about the lineup and grab some tickets before they sell out- we’re told that they’re very low. 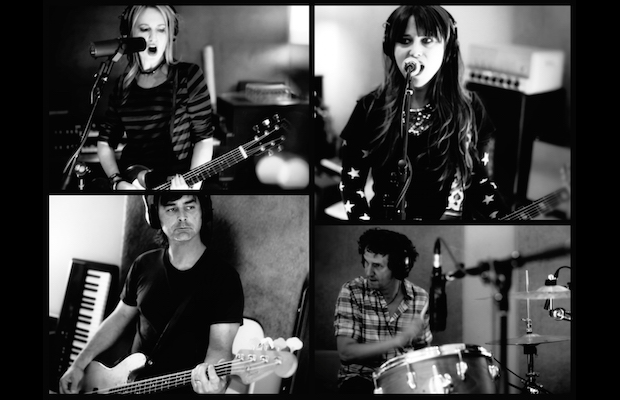 Nineties pop-alternative band Veruca Salt have reunited with their original lineup for the first time since the 1997 album Eight Arms to Hold You and teamed up with the producer of their 1994 debut American Thighs for the new album Ghost Notes, which is set to come out this month. The reunion of Mazzy Star in 2012 inspired founders Nina Gordon and Louise Post to bury the hatchet after Gordon had left the band under less than amicable circumstances in 1998. Ghost Notes picks up right where the group left off, with aggressive guitar and hooky melodies featuring harmonies between Gordon and Post. It sounds like the twenty years of fighting never even happened. The New York-based pop-punk band Charly Bliss carry on Veruca Salt’s tradition of sickly sweet guitar-driven pop. The band have been compared to the Yeah Yeah Yeahs with frontwoman Eva Hendricks morphing Karen O’s gritty-glitter aesthetic into her own animal. Their latest EP Soft Serve is appropriately titled for their sugary rock. The local-via-NYC American Dream began as a duo between members and multi-instrumentalists Corinne Callen and Tommy Furar. Their music is like dream pop mixed with psychedelic western energy (provided by the appropriate addition of a lap steel played upon their move to Nashville) and girl group inspired vocals. They’re looking to release a full-length soon. Veruca Salt, Charly Bliss, and American Dream will perform Tuesday, July 21 at Mercy Lounge. The show is 18+, begins at at 8 p.m. (doors at 7 p.m.), and tickets are available for $20.